The questions are compiled from genuine questions that people ask. When the same or similar question is asked by many people, we add it to this page, so if you have a question that is not listed here, please don’t hesitate to ask through our Contact Page. The questions are divided into sections to help you find your query. The answers expand on the page, below each question. There are loads of tips and tutorials online, and soon this site will be heaving with them too. Why not Sign up to our newsletter and get new articles, tips and tutorials straight into your inbox? I have been making art for some time - is there anything you can offer me? Why yes! Even seasoned professionals need inspiration, encouragement and help at times. Other artists often have so much to offer by way of inspiration and ideas. We seek them out and write about them or link to their websites. Our newsletter, while not sent frequently, can keep you informed about Art Events and articles as well as tips and tutorials. You can use the form below to sign up now! Please go to our Tutorials page here. You can also use the search box near the top of this page to find specific subjects. Do you offer private art classes? Taking classes can certainly help both beginners and long-time artists, as it is always beneficial to get feedback from instructors and from peers. We also know that many people find it motivating to connect with teachers and other artists personally. People you meet in those circumstances sometimes become life-long friends. Contact your local community college or local art center! Your local art shop might know some good places to take classes or perhaps have leaflets left by others. If you can’t afford art classes or there aren’t any available in your community, consider joining an online art community. Many have lots of beginners and experienced artists helping each other and sharing information. You might find something through the BBC learning section. What am I letting myself in for if I sign up to your newsletter? Nothing intrusive will happen. We Never share your email address with anyone else, and you have to confirm with Aweber, our secure email provider, before you get anything from us. If it all gets too much or you don’t want to hear from us any more, you can unsubscribe at any time by clicking the ‘unsubscribe’ link any email we send (Boo hoo -Please don’t leave!). In fact our newsletters are infrequent and usually contain a summary of various types of information that we think might interest you, perhaps a summary of our latest articles or some great exhibitions about to start. We may occasionally inform you about discounts or special deals on products and, when available, we may send discount coupons for our own products that are only for our subscribers! Here is where you can sign up to our Newsletter. Sign up to our newsletter for inspiration and news about tutorials, tips, art materials and events. Which materials and equipment mentioned on this site are your own brand, Outlines? Outlines Acrylic Paint Set and Outlines Single tube of White paint. Tubes of individual colours from the set are available in the Paints section of our Shop. What are the colours in your 12 colour paint set? What can I use your paint on, what painting surfaces will they stick to? Canvas, board (including mountboards, MDF and plywoods), paper, cardboard, wood, metal, stones and pebbles or rocks, fabric (including natural and synthetic fabrics, most plastics, and many other surfaces that have a bit of texture. It’s Great for up-cycling too – we have painted cereal boxes and other packaging to create and recycle. Your imagination is your limit! Results on some materials can be improved with a little preparation. Acrylic paint may scrape or fall off easily from very smooth surfaces if soaked in water. However, our paint can be used for decoration on materials such glass that will not need washing such as jars and bottles. As time goes on, you will find articles about ideas and techniques for painting on all these different surfaces. Can Outlines paints be mixed with other materials? Yes, they can be mixed with any mediums intended for use with acrylics, such as gels and thickeners. They can also be mixed with sand or grit, used with decorating and DIY products such as water based wood-glue and many found substances that will give it a texture. It’s a very versatile paint! How do I clean up after painting? 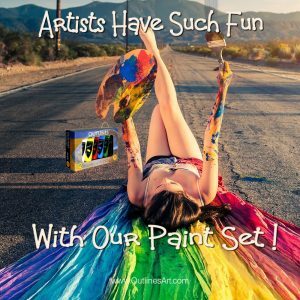 Acrylic paints are water-based and can be washed off brushes and surfaces while still wet. Dried paint on brushes will ruin them so we recommend wiping off any excess then rinsing them in small amount of water. Please refer to our article, Disposal of Rinse Water. I want to know the specifications, safety and the environmental impact of your paints. Please go to the Product Information pages here to read detailed information. Where can I find the CE certificate? Please go to Certificates and Documents to download the pdfs. Where can I buy your paints and artworks, do you have a shop I can visit? Our products are sold online only. Our paints can be bought at Amazon.co.uk and from our online shop. We do not have a shop that you can visit, only a studio where we very occasionally hold open studio events when artworks and some finished goods can be purchased. Such events will be announced in the news section, on our Facebook page and on Twitter. Can I buy other items that are designed by your artists directly from you? Not at present, we do not handle payments for other people’s products directly from this site. Our designs are available on many items that are not stocked by us. These are printed on demand by outside services and you are purchasing directly from them. We may list such products in our online shop from time to time and they will be clearly marked. Our articles may mention products we have designed, used or recommend. On pages where they are mentioned, we usually provide links to purchase. Why do you mention all those other products - do you make money from those? We aim to be as helpful as we can to our users about making art and practicing crafts. Gathering information and writing about all those subjects takes time, effort and money. Where possible, we link to sites and quality products that are relevant, fun or useful. Some, but by no means all of those links, may earn us a small commission. Commissions earned help to pay for the running of this site. Our Own Products and Designs that are stocked by us show shipping details when you add them to basket. To see an estimate please enter your postcode or zipcode in the delivery address box. Items can be removed from your basket at any time before making a purchase. We do link to some products that We do not stock: Shipping is set by the company where you are buying the item. I ordered multiple items but haven't received all of them. What's going on? Our Own Products and Designs that are stocked by us are sent by us. We provide tracking codes where possible. Products listed on Amazon are sold by Amazon. Items we have designed are printed on demand and sold by outside services and you are purchasing direct from them. We may link to Other products that are sold by others. Please direct your delivery enquiry to the website or suppliers where you purchased the item. Sometimes your orders will come from different locations, so you may receive one item before the next. I have searched for your paints on an Amazon Eu site but couldn't find them, what should I write in the search box? You might Try writing ” Outlines art materials Acrylic paints ” or click here for the UK search They should come up at, or close to, the top of the results. I have an opinion or want to give feedback. Can I comment on your articles? Comments are moderated and will not appear immediately. Please be patient while they are processed. I would love you to feature my project/ something I have made. Can I tell you about it? We’d love to hear about your ideas and the things you have made, especially if you have pictures we can show our readers! Please go to this page, read it and then use the form at the bottom to write to us about it. I would like to write for you or submit an article for your website. Great! Please go to this page, read the instructions for Authors and then use the form at the bottom to submit your article. Information about Privacy, Terms and Support can be found in the side-bar or footer of most pages.